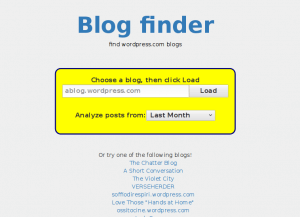 Blog Finder is live here! When reading a blog, you find comments and also, on WordPress.com, likes, i.e. someone is telling she/he likes a post. Usually you see one post at a time, but maybe you are interested in seeing all the users that commented or put a like. Blog Finder solves this problem: it scans all the posts in the time period specified and shows a list of users that commented or liked a post. You can select last week, last month or last six months as periods of time. If I see interest in the product I may extend Blog Finder data fetching to Blogger too. Blog Finder uses the WordPress REST API and the WordPress.com REST API to fetch data about blogs, comments and likes (they are quite similar, but not equal). which searches for posts containing a specific keyword. The WordPress REST API was introduced into WordPress in the 4.7 release. To use the WordPress REST API, you can issue direct “low level” HTTP calls, but you can also use the Node WP API (it is called Node WP API but works even without Node). You can find a list of WordPress REST API applications here. Blog finder uses the promise queue package to be polite and make only two request at a time when fetching data.